Special, elegant and artistic - It might be the first impression on this candle holder. But actually it not only has these advantages. 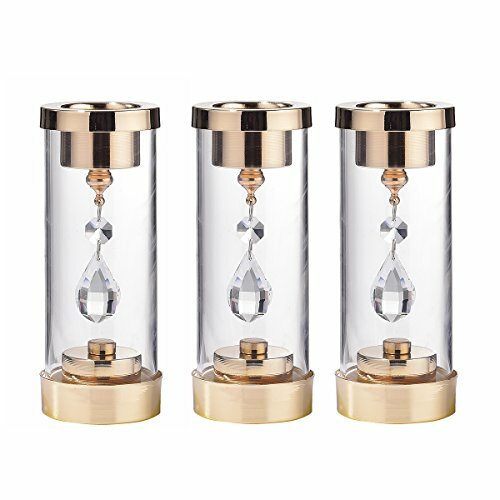 In addition to the smooth line design, elegant structure and unique craft, this crystal candlesticks is also a product with high quality. The iron pedestal with polished chrome finish provides the candle holder set a firm support, which guarantees the stability of the holder. This candle holders stand is not only practical but also decorative. It can be used for candle and LED candle light, but also be a part of decorations for different occasions such as homes, clubs, bars, hotels, parties, weddings, spas and so on. It's also a great gift for your family and friends. When the table or mantel is embellished with these candleholders set, they would be no more monotonous as usual and turn to be more impressive for your guests. A classic holder candle set, gives you a special feeling and moment! ★Elegant Design: With polished chrome finish iron pedestal and exquisite K9 crystal, this candles holders set is substantial and artistic, very impressive on your table or mantel. ★Multipurpose: Ideal candelabra for home decors, clubs, bars, hotels, pillar candles, tea lights, wedding gifts, parties, spas and aromatherapies; perfect candle pillars holders for gift tables, cake tables, cafe tables, head tables and centerpieces.Also,great candles stand for graduations, birthdays, anniversary, Christmas, thanksgiving and special occasions to your family and friends. ★Leading warranty service:Full refund or new replacement within 30 days. If you have any questions, please feel free to contact us. If you have any questions about this product by Winjoy, contact us by completing and submitting the form below. If you are looking for a specif part number, please include it with your message.